Today’s inspired screencap choice comes to us from the brilliant mind of tyme4t. Thank you kindly, tyme4t! 😛 Here is the lovely John Porter as portrayed by Richard Armitage in Chris Ryan’s Strike Back. Also, massive thanks to RichardArmitageNet.Com for all the very high quality screencaps in their Strike Back Gallery and interviews on their Strike Back Downloads page. Apparently, MI-6 doesn’t pay well enough for John Porter to afford a shirt. Or are there other forces at work? Whatever the case may be, I have created a plethora of graphics from this screencap. I created my my first-ever Flash video! I was influenced by one of my facebook friends who posted a very clever clock so I decided to try my hand. Since Flash is not allowed on my blog, I am linking to a free website I am using to host my Flash projects. I may be moving to another blog server, but since that will take a bit of planning, this will suffice for now. Finally, I also made a wallpaper. This one is not animated, LOL! Click for full size (1920 x 1080 pixels). I appreciate your participation, tyme4t! ANNOUNCEMENT: Now that I am learning Flash, you can suggest a song or a sound bite. There are a few spaces left if you would like to participate in the PortEmber challenge. And if you have already submitted for either PortEmber or The 12 Days of Guyness, please contact me if you have any song or sound suggestions. 🙂 I can’t promise I will use them, but there is a possibility. This entry was posted in Animated GIFs, Graphics, richard armitage and tagged animated gifs, chris ryan, chris ryan's strike back, fan videos, graphics, john porter, richard armitage, richardarmitagenet, richardarmitagenet.com, richardarmitagenetdotcom, shirtless, strike back. Bookmark the permalink. OMG, need an ice bath….you’re the best! @Monica: There is some evidence that Richard Armitage is partly responsible for global warming, LOL! @Bccmee : Oh yessss, Richard is à 100000% responsible for global warming, LOL LOL LOL. @Monica : I need one too, swoon… LOL. @Ana Cristina: Hope you have better luck later later with the Flash animation. That is one of the disadvantages of Flash files; they are sometimes blocked by security software. I’m glad you enjoyed the other graphics! They’re all very similar but I couldn’t stop myself, LOL! @Ana Cristina: I’m delighted you were able to see the clock in action. I see no signs of stopping my obsession, by the way. Thanks for your lovely comments! Bccmee, I really love it!. However still I can’t take my eyes off of Flash animation, even didn’t think that the clock in the animation may indicate an hour in line with my watch. LOL! @Teuchter: You’re most welcome! The clock uses a script with the command line “var now:Date;” which picks up the time on the computer’s clock. And I totally agree that the creative team behind Chris Ryan’s Strike Back knew what they were about when they had John Porter take his shirt off, LOL! I hope you weren’t late for anything. 🙂 Thanks so much for you comment! That was so cool! But I had to look several times to notice the movement of the watch! There were big distractions on the way! I was lucky enough to view your masterpiece before leaving for work. Oh dear, my afternoon was much better! My fav is the wallpaper, even if I could never use for my notebook as it’s rated M/R. I agree, it is too early to get dressed, better if Porter never get dressed! @Carla: Yes, the graphics are a bit naughty. *giggle* But I only used the actual footage … I didn’t Photoshop out his shirt, LOL! Bccmee I love all that you have done with this capture. I loooooooove the flash animation , so elegant. The animated gif is too hot to let me be wise. I absolutely love the face’s expressions of Richard , he is just adoRAble (I love his body’s expression too L.O.L.). I know what I’ll dream about tonight…certainly I’ll be very deceived tomorrow to not find this nice gentleman by my side at the waking up. Great flash and gif, etc. With a clock like that, who would want to tell JP that it’s time to get up and dressed? Not I. In fact, let’s not. 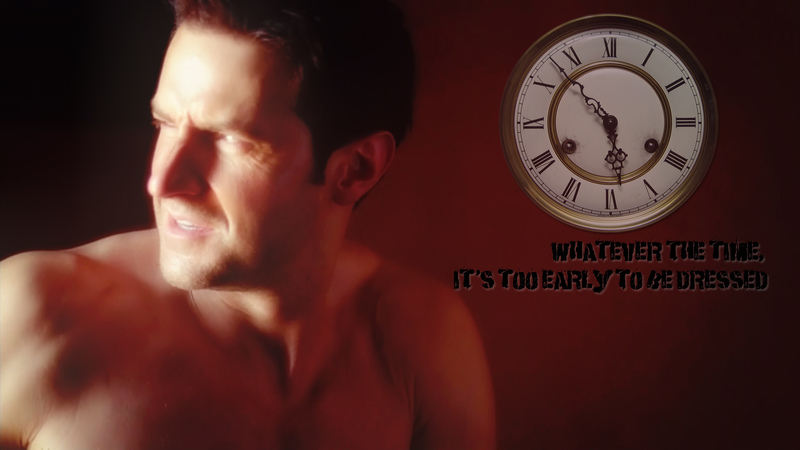 I say we institute, “Richard Armitage Daylight Prevention Time” (RADPT)–somewhat akin to the notion of “Daylight Savings Time” in the U.S. My reasoning is that if it is not daylight, JP won’t be compelled to clothe his manly muscular torso. Sighhhh! I’m being a silly goose, I know. But I blame it on the perimenopausal hormones surging through me. Ha! I can’t wait to see tomorrow’s offering. Yes, we should submit your idea for RADPT to the authorities as soon as possible, LOL! Awesome graphics! I love the clock! I love it all! WOW, bccmee…that clock even works in Australia! How on earth did you do that? I’m extremely impressed. By the way, I’m answering you at 8:55 AM Friday in New York City time. @kathryngaul: John Porter definitely needs more rest. Not sure if he will get any this month though, LOL! It’s always Porter o’clock! *ding dong* He certainly rings my bell! John Porter bathed in morning sunshine……..goose bumps!!!! Great work Bccmee, you are the master! Great job! I have to agree with @mersguy: goose bumps, indeed! Extraordinary work,Bcc.The clock works perfectly. I love the caption,very creative.YOU ARE.A GENIUS! Just a question. How can we save it in our pc, to see the time … I mean J. P hours ter? @Tereza: That’s very sweet of you to say, but I have to confess I used a tutorial, LOL! Thanks bccmee. Great work! Can’t believe this is your first try! And thank you also for the animated gif and the sig. What a treat for a chilly November day! @grendel’s mum: Again, I thank you for your continued support. I really appreciate you featuring my little graphics on your blog! I forgot it was chilly with hot John Porter around, LOL! Artistic eye and technical ability is going to project your career into high gear, bccmee. Your “focus group” here has no doubt of it! @fitzg That’s what we are alright a “focus(ed) group”! Sounds very professional and sensible – as if! @bccmee, you keep us smiling and entertained and we love it. Time in real life did not allow me to properly acknowledge these FANtastic works! Although I didn’t really notice the clock until I could peel my eyes of JP/RA with no shirt….goodness he has lovely shoulders 🙂 ….the clock is really cool! Love the captions and soooooooooooo looking forward to the rest of the month. Must always make time in real life to enjoy RA!